A corner of the living room looking into the music room, where the same olive branch pattern is used for the wallpaper and window treatments. The neutral palette highlighted with blues and greens was inspired by the painting over the fireplace, which is by Paul Stone and was purchased at Bayview Gallery in Brunswick. In the foreground is a favorite chair recently recovered in a houndstooth check. Travis Kinney of Gulfshore Design in Scarborough redesigned the fireplace with new moulding and a marble surround. The birds on the mantel are from Antiques on Nine in Kennebunk. The piano bench fabric is from Romo. The homeowner loves design books, which are featured amply on the bookshelves in the music room and on the coffee table. The home was originally a John Calvin Stevens carriage house. What is now the dining room was once a stall for horse drawn carriages. 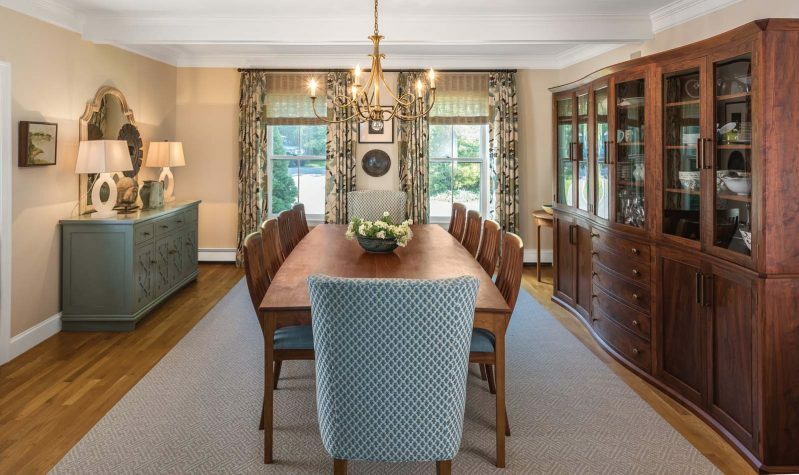 The table, chairs, and glass-front black walnut hutch were all built by the late furniture maker David Margonelli. To downplay some of the formality of the room, interior designer Brett Johnson and his Portland-based Maine Street Mercantile and Manufacturing Company reupholstered end chairs with Romo fabric and designed and built the custom buffet to the left. 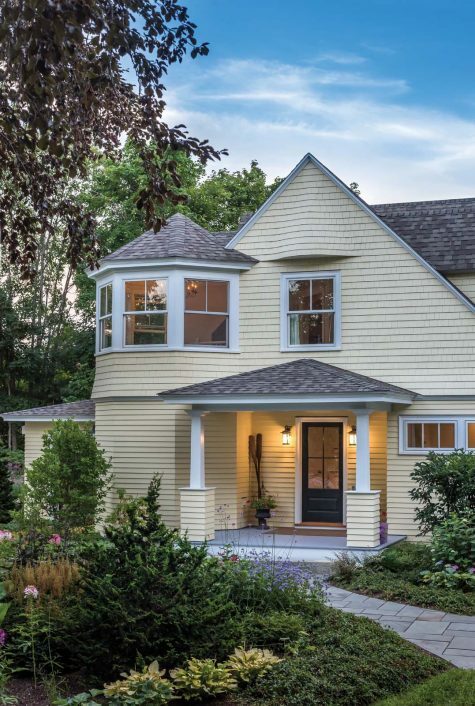 A kitchen redesign sparked a larger house renovation by Wright-Ryan Construction in Portland. 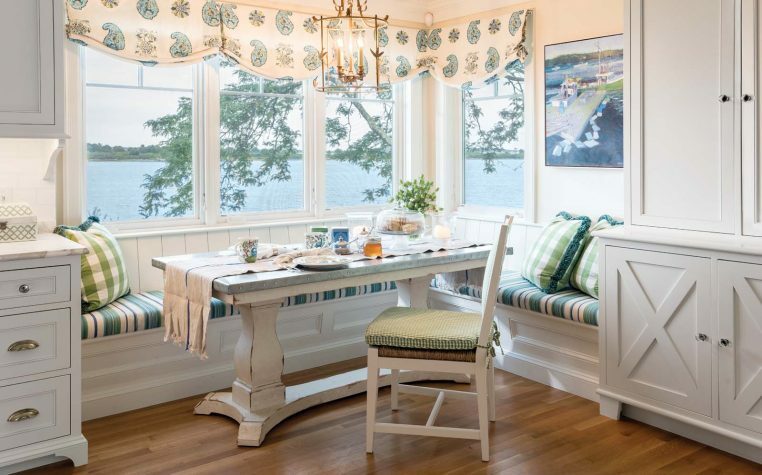 A double-height island is to the right, and a built-in breakfast nook to the back. Where there once was an exterior wall, there is now a piece of steel holding up the second floor. The cabinetry and millwork, the details of which repeat throughout the house, were also executed by Wright-Ryan. In the kitchen, small touches include the curve over the sink, the V-match ceiling, and the X-detailing on the far hutch. Oak was used to match the existing flooring. 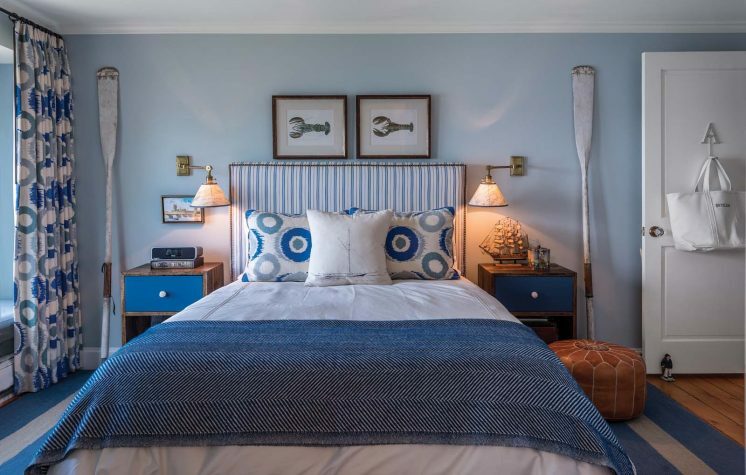 The boy’s bedroom has a nautical feel, thanks to the palette, oars, and antique lobster prints. The upholstered bedframe, linens, and nightstands were all produced by Maine Street Mercantile and Mfg. Co. This room always felt a little dark, so during an earlier renovation Travis Kinney opened the space to the kitchen and added transom windows. 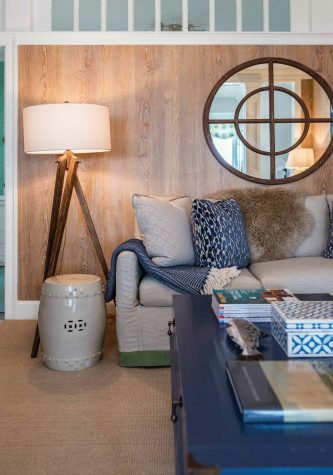 For the most recent renovation, the homeowner decided to embrace the “den” nature of the room with wool and sheepskin throws and wallpaper that suggests wood paneling. The coffee table is from Somerset Bay, the couch from Lee Industries, and the pillows from Maine Street Mercantile and Mfg. Co. The homeowners’ bedroom receives very bright sunlight during the day, so a continuous rod allows curtains to wrap the room. 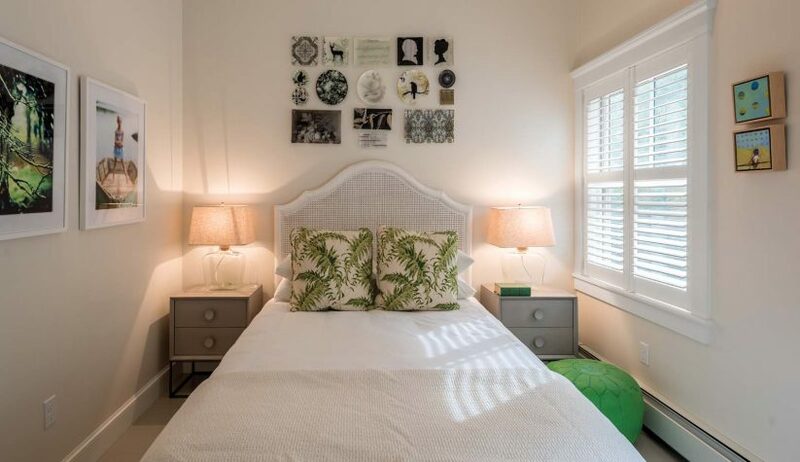 The fixture above the bed is called an opera chandelier. 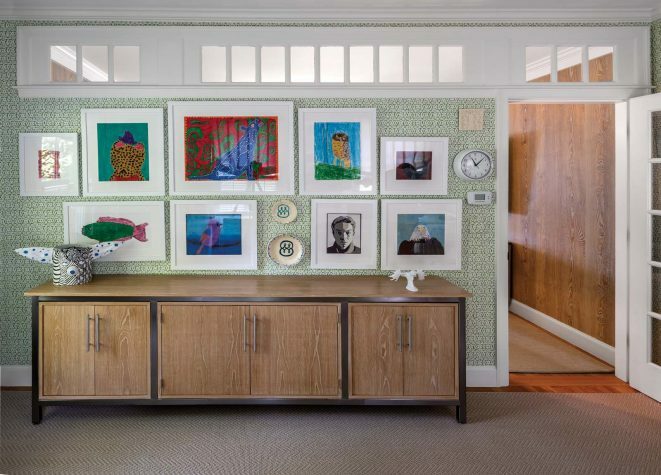 An office off the kitchen features a wall of the children’s artwork—all framed at Casco Bay Frames and Gallery in Portland—as well as a metal and limed-oak cabinet custom designed by Brett Johnson. A breakfast nook with a French-inspired custom table. 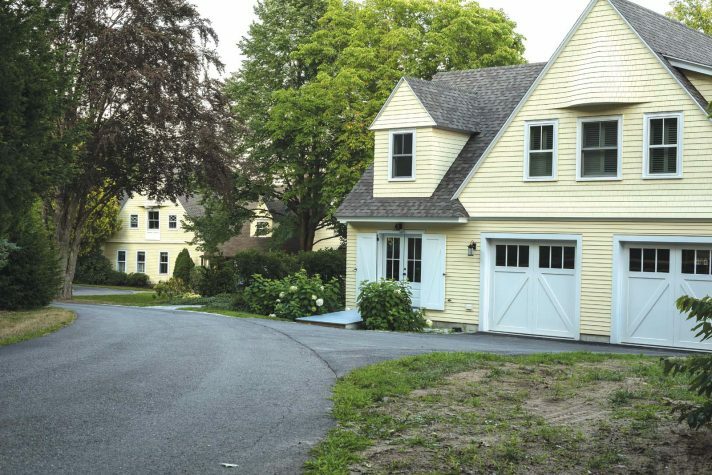 The architectural detailing of the guesthouse mimics the original carriage house with an eyebrow shingle detail above the second-floor window and shingled porch columns with tapered white posts. The front porch has a row of rocking chairs from L.L.Bean. A painted runner on a curved staircase. 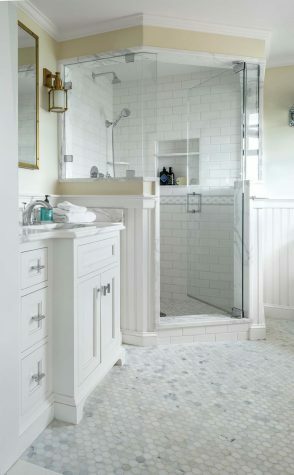 A bathroom features a marble floor and a glass shower stall with subway wall tile. The second floor of the new garage has a guest apartment outfitted with cabinets that were repurposed from the carriage house kitchen. Once the pillows are removed, the sectional sofa is as wide as a twin bed and perfect for overflow guests. The garage has a guest apartment upstairs and a downstairs space that could house a third car if need be. 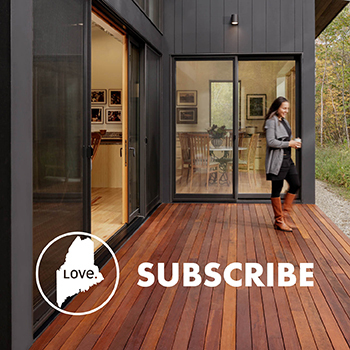 Otherwise it serves, as Travis Kenney says, as “a glorified potting shed” and extra entertaining space. The radiant-heat floor is epoxy on concrete. Oversized sliding doors open the room to the patio and ocean outside. Lynn Shafer of Shafer Landscaping in New Gloucester has been working on the grounds since 1996. The homeowner says, “I love his vision for creating spaces and how he imagines how the eye travels and lands. He works by layering (and not always to plan), which I love. 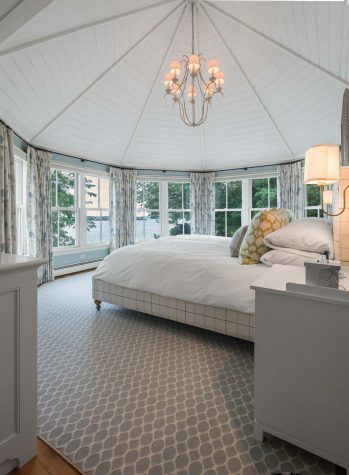 It is sort of how I feel you layer things on inside too—wallpaper, pillows, throws, lighting—to create a mood.” Here, the design provides a visual connection between the terrace at the back of the guest house and the carriage house. The new living room windows have a curtain rod that allows curtains to cover two walls of the room. The English arm sofa is by Baker. The fabric for the curtains and the reupholstered sofa and chairs is Romo. 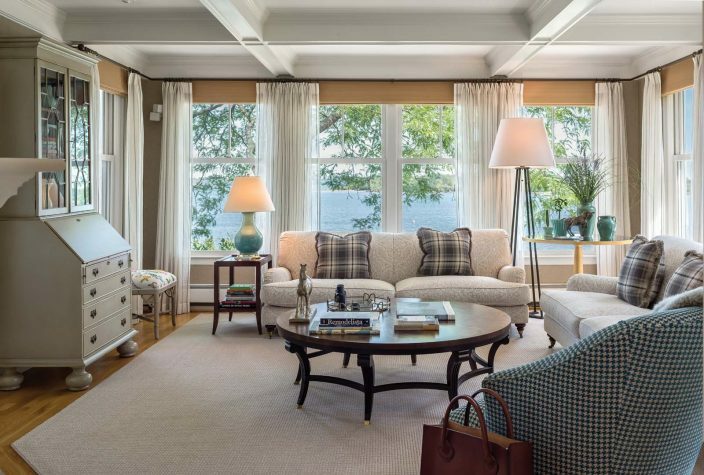 The homeowner likes to mix what is often considered “feminine” (the paisley on the sofa) with touches that are “masculine” (the plaid on the pillows). Also seen here is a hutch and crewel-topped bench from Somerset Bay to the left and a blue- based table lamp from Christopher Spitzmiller. The guest apartment bedroom features a decoupage plate collection above the bedframe. The answer? Brett Johnson of Maine Street Design Company. “I went to high school with him!” the homeowner enthused. But it was more than that. She’d once had a summer job in the women’s clothing section of the Works, a Brunswick shop that Johnson used to manage. The two had even modeled together for store ads. Given her admiration for the inn, the homeowner wanted to work with Johnson again, this time on the John Calvin Stevens carriage house that she and her husband had bought in 1996. At the time of the purchase, the structure looked like a house, but pictures from the turn of the century suggest it originally consisted of a hayloft, carriage stall, and stablemen’s quarters. When Johnson and the homeowner reconnected, the repairing and outfitting of the home had been going on for years, starting back when the roofs were so leaky that she hooked tarps to the ceiling, one of which had a hole cut into it to let the rainwater drain into a Rubbermaid container on the floor. 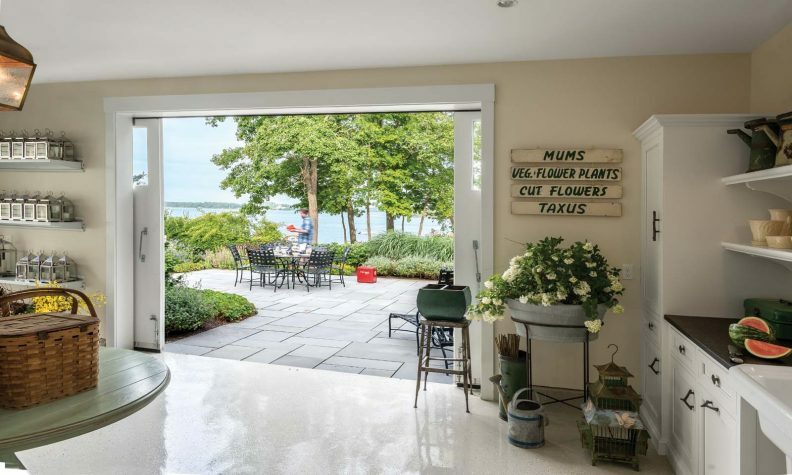 Johnson saw the family through subsequent renovations, the most recent of which was a collaboration that pulled in designer Travis Kinney of Gulfshore Design in Scarborough and builder Tyson Abbott of Wright-Ryan in Portland. This time around, the project involved rebuilding a portion of the existing structure, as well as the construction of a whole new garage/guesthouse. The carriage house renovation was sparked by Kinney’s knowledge of building codes, specifically his awareness that the home could be expanded five feet toward the ocean, something they hadn’t thought possible and something other designers hadn’t ever observed. 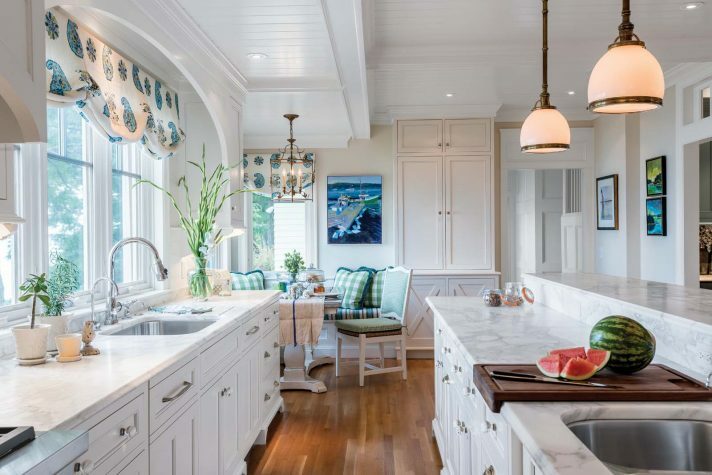 The additional space allowed Wright-Ryan to use Kinney’s design to build a new kitchen with built-in breakfast nook, pantry, wet bar, double-height island, and trim details that include a coffered and V-match ceiling, crown moulding, and a valance over the stove. A mudroom with herringbone slate tile was added on the ground floor, and the boiler room was relocated. Upstairs, a single bathroom and laundry room were reconfigured as a laundry room and two bathrooms—one for the couple’s son, the other for their daughter. Meanwhile, the new guesthouse mimics the carriage house’s exterior, with a similar roofline, turret, and eyebrow over the front entry. Also, as on the main house, yellow clapboards clad the lower half of the structure, shingles clad the upper, and the entry columns consist of white posts on shingled column bases. The guesthouse’s ground floor has a garage space. Its epoxy concrete floor has radiant heat and thus can double as an entertainment space. A large room serves as a glorified potting shed. Its oversized barn doors slide open onto a large bluestone patio with ocean views, allowing for indoor/outdoor entertaining. A smaller room has a double sink, one side of which is slate and which Kinney rescued from his own barn. The other side serves as a dog-washing bay. The husband of the couple, an enthusiastic cyclist, also works on his bikes in this space. A spiral staircase leads to a second-floor landing with a small office and then to a one-bedroom guest apartment with exercise room. The homeowner describes herself as someone who both loves to shop and has “a thing” about being organized. She also confesses to a “little addiction to design books,” an obsession borne out by the volumes stacked (neatly!) on shelves and coffee tables throughout the house. 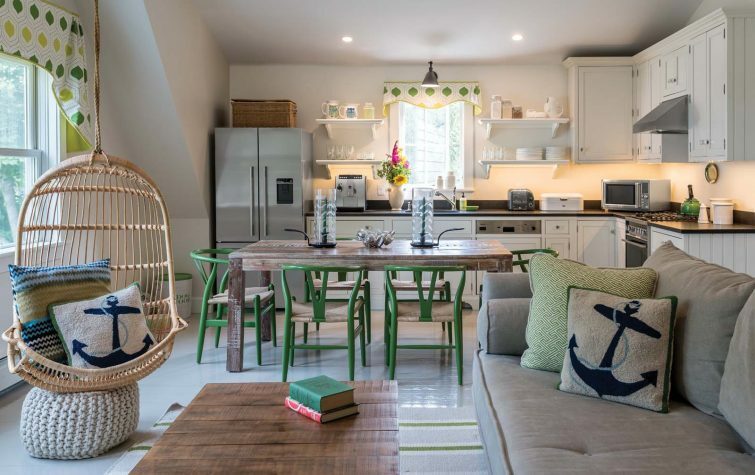 Her good eye, says Lisa Morris, assistant designer at Maine Street Design Company, is always an asset. “There’s no problem with her going rogue,” she jokes. As a result, the house is both beautifully appointed and rather cleverly put together, particularly when it comes to storage. The former is evidenced by features typical of Johnson’s team: window treatments and upholstery with extraordinary fabrics, custom furniture pieces designed by Johnson and built by artisans subcontracted by Maine Street Mercantile and Manufacturing Company, and unusual wall and floor painting. For instance, the living room—which Morris opines might as well be a show space for the high-end fabric supplier Romo—has tissue-thin curtains hung on a continuous rod that wraps two walls, as well as older furniture made new again: a blue and white houndstooth check for a favorite chair and wheat-colored fabric for couches with English arms and tight backs. Johnson designed a dining room buffet, floating nightstands for the son’s nautical style bedroom, and a metal and limed oak office cabinet with a pull-out paper shredder and bill scanner nook. 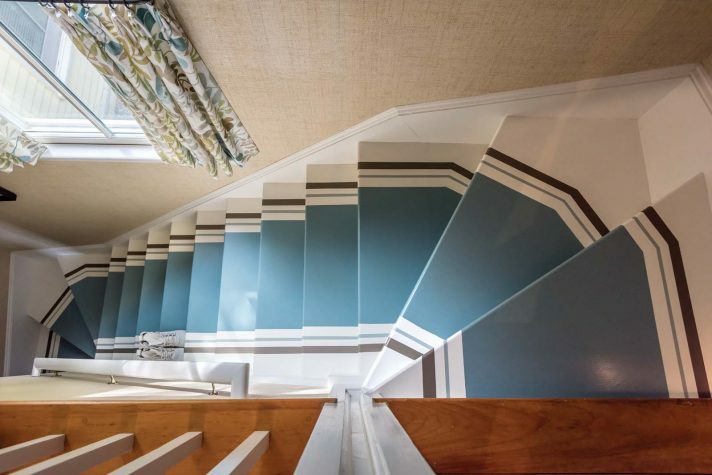 A blue, brown, and white runner is painted onto a curved back stairway, and the daughter’s bedroom has a white wall given a striped effect by adding a clear coat of urethane. Meanwhile, Gulfshore Design and Wright-Ryan collaborated on impressively detailed cabinetry, such as the bluish gray wet bar with antique mirror-tile backsplash. The storage solutions are a lot of fun for someone who likes to see how things get tucked away. Abbott says the homeowner “knew where she wanted to put everything. All the inserts are custom for her utensils, her dish towels… Everything has its spot.” There is even a built-in dog dish and a special area for dog treats. Abbott also notes, “The laundry room is the nicest one I’ve ever been in.” Kinney designed it with a farmhouse sink and soapstone countertops. An upper cabinet hides a TV. Others conceal pull-out drying racks, a flip-out hamper, and a pull-down iron. The drawers are neatly sectioned for batteries, flashlights, etc. Stools allow mother and daughter to sit together at a small sewing station, where the daughter does crafts and other projects. Throughout the house, cabinetry features doors that open then pivot to slide back into the cabinet, as in the downstairs mudroom. Here, the doors hide a coat closet for each family member. The individual cubbies include an upper drawer for hats and mittens, a lower drawer for boots, and an outlet for charging electronics. The mudroom closets share one wall with a built-in dog kennel. Elsewhere, and as part of an earlier renovation, foyer benches (modeled after the pews at the church the homeowners attend) were built so what looks like under-bench paneling is actually a drawer. 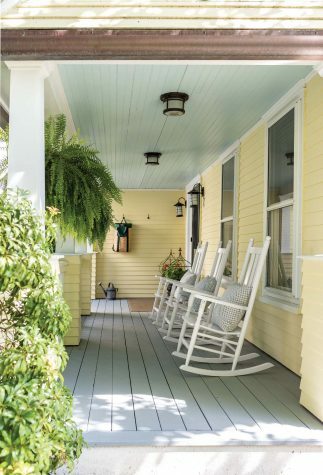 The carriage house’s palette is neutral with blues and an occasional pop of green. One surprise is wallpaper, which has been out of fashion, until recently perhaps. Johnson says, “I used to have a bias against wallpaper. The homeowner loves wallpaper, and she has opened my mind to this amazing resource.” A family room off the kitchen—somewhat brightened in an earlier renovation with interior transom lights—has always felt dark to the homeowner. Finally, she decided to embrace its “denlike” nature and wallpapered it in “faux bois,” which looks like wood paneling. 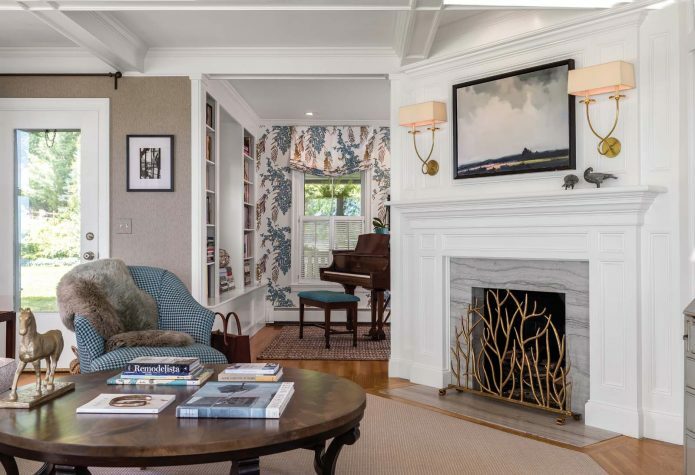 Meanwhile, an office off the family room has a light butterfly print against a dark ground, and the music room with its grand piano uses the same olive branch print for wallpaper and window treatments, making for an interesting merge between flat and folded surface. Part of the homeowner’s shopping enthusiasm has her seeing decorative items—often at a favorite store like Kennebunk’s Antiques on Nine—and not being able to get a piece out of her head, and thus returning in hopes the object remains unsold. In this way, and through visits to favorite events like the Maine Antiques Festival in Union, she has fashioned some collections—one of vintage watering cans, another of white pottery—and also bought signature pieces, like a Buddha’s head and mandala for her dining room buffet. But she also likes a different one-of-a-kind piece: artwork by her children. An office wall has school-age projects framed and hung salon style, and the guesthouse has a cupboard topped by three globes formed out of paper strips of her son’s poetry. Having started working with Johnson decades ago, the homeowner isn’t inclined to stop. Nor does she want to break ties with her designer and builder. Or even to stop imagining and reimagining her house. Next up? A redo of the owners’ bathroom and an update of an upstairs space that once functioned as a toy room and will soon become, if husband and son get their wish, a den for recording and mixing music. Maine Street Mercantile & Mfg. Co.
Woofer Audio Video Electronics, Inc.